I finally done it! I wanted to try out MAC brushes for so long and I finally decided to splurge on 4 brushes for a start and now I can't wait to buy more. The price tag is so hefty, but definitely worth the money, well I can only comment on the brushes I own so far. The brushes I already own are from Sigma, Sephora, Real Techniques. MAC #219 is a pencil brush, I love to use it to apply white eyeshadow in the inner corners of my eyes. You can also use it on lower lash line, to apply eyeshadow or blend it out. It's really soft. MAC #266 I just wanted a new sharp brow brush, as the brushes I own weren't as good as I expected. This brush is just amazing for my brows, it's gives them the sharp look I wanted, I know that MAC also have slightly smaller brush, which you can also use for brows, but the MAC make-up artist recommend the #266 brush, so I went for it. 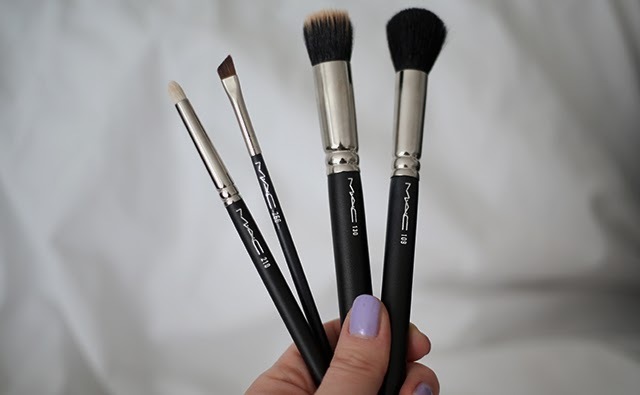 MAC #130 I love duo brushes, they are great for applying bronzer, blusher and even foundation! This is my smallest duo brush, it's just amazing. I tried to use for applying foundation and it's works so well. I also like to use it for applying highlighter. MAC #109 The softest bronzer brush I own, this is my favourite size of a brush to apply bronzer, so I just don't over apply it. I am really happy with my four brushes, so far they are really good. Although, Sigma is very similar brand, based in the States, the brushes are also good quality and cheaper. I've been dying to purchase some more MAC brushes for the longest time, I own the 217 and multiple sigma dupes, but nothing beats the originals right?! I really want the 219, as it's impossible to find dupes of the same quality and size! I have the 217 and honestly it's changed the way my eyeshadow looks, I'm itching to try more too!